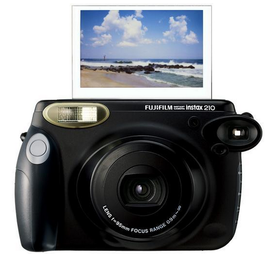 Auto Flash & Auto Focus - Take bold, vibrant pictures, even in low lighting. LCD Control Panel - Clearly displays focal distance and film count while giving you more control to change the shooting mode and focus (adjust the exposure settings and focus). 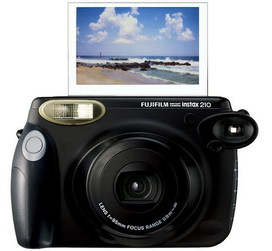 Uses Fujifilm instax Wide Format Film (10.6 x 8.4 cm) - The unique super-wide format film allows you to fit more in your frame to capture large group shots, clear macro close-ups and far away landscapes. Close-up Lens & Self-Portrait Mirror Attachment - Shoot from up to 35 cm away for enlarged images with the close-up lens or capture photos of yourself and friends with the self-portrait mirror. Built-in Lens Cover - Protecting your camera is easy with the electronic lens cover that automatically opens when the camera turns on.